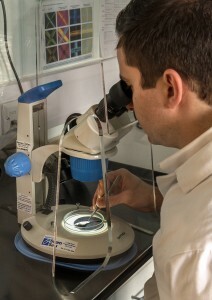 Enquin Environmental has its own in-house laboratory for asbestos sample analysis, located at our Cardiff Head Office. Our laboratory is UKAS accredited and enables us to deliver a fast turnaround of sample analysis results. This quick and efficient sample analysis service is crucial to many of our clients and helps them meet any deadlines for impending works. Samples brought into our Laboratory can be analysed and a full certificate of analysis produced within 24 hours. This quick turnaround also ensures we adhere to any Key Performance Indicators (KPI’s) or Service Level Agreements (SLA’s) requested by our clients. Our laboratory team ensure a rapid and fully traceable turnaround of samples, whether they are taken by our own Surveyors during surveys or are third party samples that have been brought in or sent to us for identification. To demonstrate our commitment to quality, we also participate in both the AIMS and RICE schemes. This ensures our Analysts are consistently delivering accurate results for asbestos identification and fibre counting. View our UKAS Testing Certificate and Schedule here. To speak to one of our asbestos management experts, call us on 02920 535090 or complete the contact form.